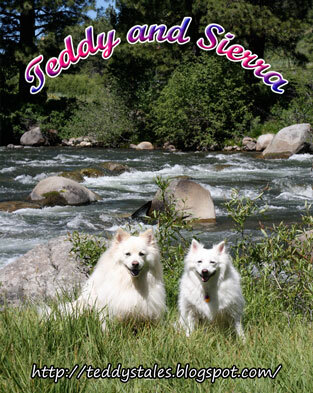 First of all, I would like to thank White Dog Diary Online and Teddy and Sierra from Teddy's Tales for lending me their pictures to represent the breeds awesomeness on this post. So with no further ado, let's get to business and talk about the breed that we all know as the "Eskies". 1. Though the documentation on this breed's origin and purpose is not clear, American Eskimo dogs come from the Spitz family. Their cousins include the Alaskan Malamute, Siberian Husky, Samoyed, Chow Chow, Keeshond and Pomeranian. 2. 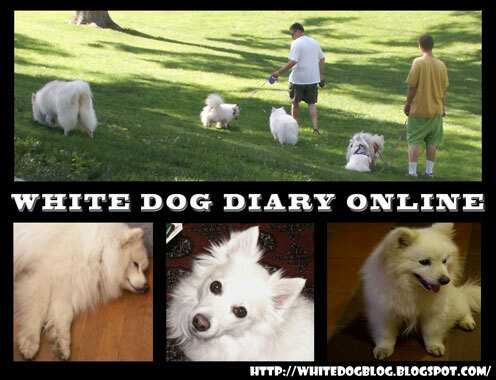 The American Eskimo's most important role is to be a family pet. They prefer being a part of the family rather than being banished in a yard. They're also very affectionate and loyal. 3. Their outstanding physical characteristics are erect pointed ears, double coats and moderate body proportion. Oh, I forgot to mention their OH-SO-WHITE coat. 4. The first American Eskimo dogs were registered in UKC back in 1913 but the breed's standards was officially adopted during the 1970s. 5. A typical Eskie is alert, quick-witted, obedient and bright. They can also be mischievous and very playful. Courtesy of Teddy and Sierra's Mom. I truly appreciate your response on my email. 6. They are exceptional watchdogs, but their looks says otherwise (With such a cuteness overload, I'm not surprised!). 7. Eskies can take a while to warm up to strangers so socialization should be started as early as possible. 8. Most common behavioral issues include excessive barking and digging. They can also be shy and hyperactive. 9. Dirt and mud rarely cling on their fur because of its texture. They shed dander at a minimal and are also relatively resistant to matting. Brushing should be done once or twice a week. 10. Males experience extreme shedding once a year while unfixed females do so twice. Males are also slightly larger. Female Eskies look more delicate but after their estrus cycle, they will shed profusely for approximately 3 weeks. 11. The average lifespan of an Eskie ranges from 12 to 14 years. Although they're a typically healthy breed, Eskies can be prone to progressive retinal atropy, hip dysplasia and patellar luxation. I share your passion. LOL! Hi Haopee, yes I really did have a horrid comment left on my bloggie just once. It was just after my first birthday and is hurt and upset me and mum. We are sure it was not a resident of Blogville - just a nasty person who thought he/she were being "clever". Only that once, and never again - that's why we changed to "pre-approval" of comments but there has not been an issue again. We felt for Sweet William but it sounds like he and his peep have cheered up by hearing it is not just their blog. Hey Rubie. That's just awful. As I've said I used to get those in Chinese. Hey Chloe and Lady bug, I might just feature you next. I have never seen one of these dogs but they look so gorgeous, just like a big furry teddy. Very interesting facts too, they would be good to live in Scotland where it is quite cold most of the time. Are you guys from Scotland? Well, American Eskimo Dogs work best in the cold weather, so I'm pretty sure they'd love staying in a generally cold place. I know what you mean. At first I thought they were just Japanese Spitz ^_^. LOL, just shows how little we know about over 200 breeds, right? They are a very beautiful breed - we know and love the WDA and we have to meet Teddy and Sierra. Great informative post - we didn't know about the link to pomeranians. Thanks for sharing. They are such a beautiful breed! ^_^. Just like Basset Hounds! That was cool to read, Teddy and Sierra are soooo cute!! I meet two Eskies on my walks sometimes, they're very friendly and uber clean!! Yes, they're said to be notorious mischief makers like you. Teddy and Sierra have this Fun House posts that's just all too funny. This was a great post, very informative! Also, love your background, it's such a happy print! Replying is starting to become a tedious process because I'm having some issues with blogger. I also love my background. Too bad I am unable to give credit to the person who made it. What a beautiful breed. But they would be miserable in our hot and humid weather. LOL. I agree. However I've seen their cousins, the Japanese Spitz, being owned by people where I live and they have so many similarities. That was a great post and alot of nice photos! 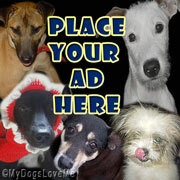 Its always nice to no about each breed of dog! Thanks. I am especially thankful that WDA and Teddy and Sierra shared their beautiful pictures for this post. Thanks for this. I don't know much about them and don't think they are a recognised breed in Australia. However, with those fine looks, I am sure they will be soon. We don't have Eskies here, but we do have their cousins. The Japanese Spitz are also not registered here in our country, but they certainly are a recognized breed because of their white fur and adorable looking faces. They certainly are beautiful dogs! Of course, all breeds are beautiful and special in their own way. Maybe I should say the same with you... Of course, I would rather say, try posting more often. I love hearing about your silly adventures. Hey Haoepee, Sure did like all the info you had on this post. I like learning more about my fellow dogs. We agree with two Doodles and a dane. When we get info like this, then My Vickie gets online and reads more and more. She just can't get enought. Dear Bert, you never told me how sick you were. I hope you get well soon. I'm glad you found the breed interesting. WDA's mom had something interesting to add in her comment. all the info on the coat was so interesting! never knew all tnat stuff about it. they are very beautiful dogs!! I didn't know it either. I also had no idea that their coat is resistant to dirt. Thank you for saying such nice things about American Eskimo Dogs. Did you know they were once hunted and persecuted in New York and other cities like pitbulls are today? Also, our breed was bred to be circus dogs because we are so agile and smart. Most dog acts still include an Eskie or two. Our double coats are perfect insulators...they keep us warm in extreme cold and cool in hot weather (that is why an Eskie should never be shaved). We are honored that you asked for our photos to use on this post. I wonder why. I've read that Eskies are family type dogs and are hardly aggressive. Did I forget mentioning they were circus performers? LOL, sorry about that. Who would shave an Eskie? The coat looks majestic and I didn't know it also keeps you cool. That's a new fact. I've never owned an AED, but in my experience as a groomer, they're also very firm about their opinions of people. We have two AED that chose which of the girls there would be their groomer and that, my friends, was that. Interesting. They've grown certain bonds with certain people in a short amount of time which makes me thing that they're probably one-human dogs. They are SO fluffy, I love them! They're as fluffy as Shih-Tzus. I agree. They are amazing doggies and their mommy writes pretty well so it was totally worth writing about them. What gorgeous dogs they are. Thanks for stopping by, nice to meet you! can't wait for your next post, Clooney. I hope you don't mind getting some dog overdose visiting here. What beautiful dogs. Thanks for sharing about them and their website. Hey Hawky, I am also taking interest in your breed but I haven't read much about CBRs yet. I think it was a hard time for you to write this one. Writing something, at the same time avoiding the temptation(frustration) of having this cute ones at home. And the price is 400-600USD? Is that the right price? Good question! I'm not aware of it's American price however you can always check Sulit.com.ph for prices of American Eskies in the Philippines. They actually look like bigger versions of Japanese Spitzes.